This week Remy has discovered slides. Remy knew about slides before, of course. He loves the stairs at any playground and often climbs to the top (with one of us nervously standing behind him) where he waits for us to go down the big slide with him. 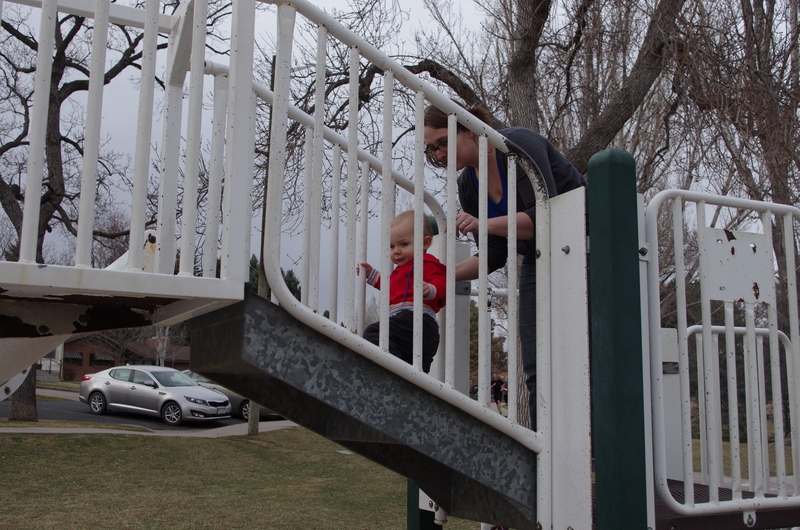 This week, we accidentally ended up at a park that had a little guy slide, and Remy immediately realized he could climb the steps himself. He could sit down at the top of the slide himself. And he could then, in fact, slide down the slide. Himself. Remy’s also figured out how to say, as well as sign, “more.” The end of the slide results in both, to make sure he gets his point across. He wants more slide, people. And the beauty of it is, he doesn’t have to wait for anyone. He can turn around and climb right up those steps himself. I didn’t think it was possible, but Remy has become even more bold. In the embarrassingly many weeks since my last post, he has also discovered how turn the laundry basket over and then stand on top of it. 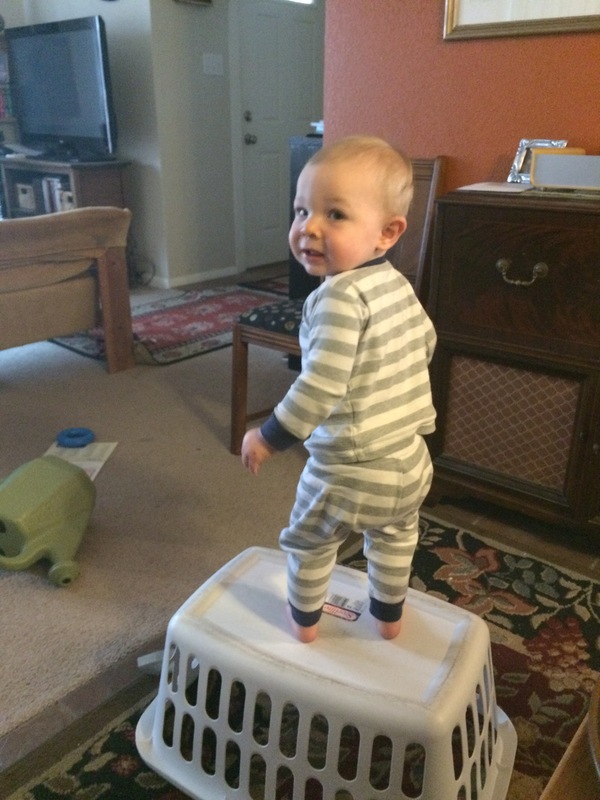 And perhaps even more impressive, he’s figured out how to also safely climb down. Remy can almost climb ladders. He goes up to complete strangers and begins jabbering away. 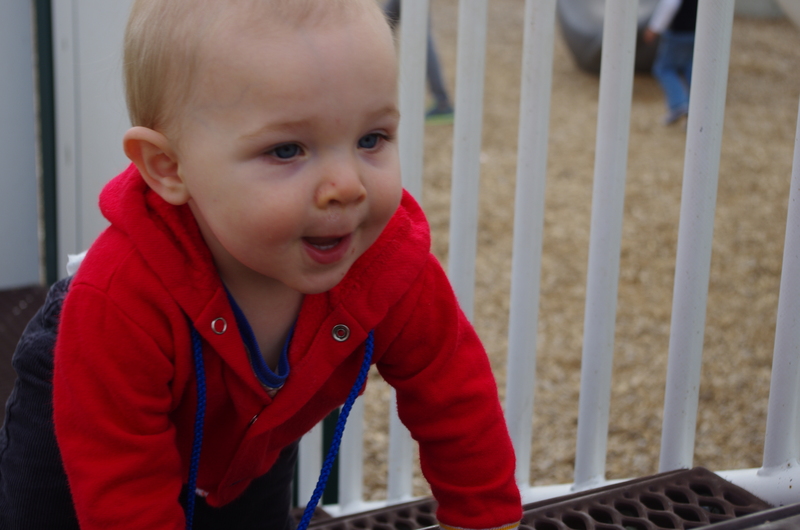 He tries to climb back up the slide after he’s slid down. He runs.Oh, experienced parents, I know that now, as is often the case, you are chuckling to yourself and thinking to yourself, “just wait….” I know. I have glimpsed the future. And it is bold; it is daring – it is exciting.When I was preggers and avoiding studying for 2L finals, I would often think about what I hoped for the then-unnamed and barely-imagined Remy. And the one thing I came up with again and again was that I hoped he would be curious. I hoped he would live life by figuring life out. And he has. With amazing, admirable gusto.Today I begin the last spring break of my law school, and perhaps any, career. To celebrate, we went to one of the wildlife sanctuaries in our town and traipsed around. It was lovely. Remy boldly attempted everything that the big kids attempted on the playground. He boldly ran down the dirt paths and stomped through the weeds. And I boldly tried to be present in those moments without thinking about the bar application or outlining or the tear-inducing Story Corps interview from this morning (seriously, I have got to learn to turn the radio off sooner). This may have been glorified procrastination. I can own that. But I’d like to think that maybe it was also a real exercise in becoming bolder. Everything will still get done. There is still plenty of time. There is always plenty to do, but when Remy asks for more slide, its very difficult to say no. Brilliant. What a little smasher he is!